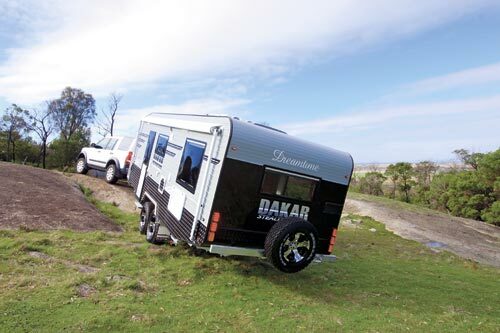 The market for offroad caravans has just got tougher with the arrival of the Dakar Stealth Series, a van that's pushing the envelope or, should we say, crunching the corrugations. The name Stealth comes from the American Stealth Bomber and alludes to the one-piece moulded fibreglass front panel which gives the van a streamlined, aerodynamic look. The black and grey colours and decals might make it possible to hide this van on a dark, moonless night, but it is certainly not stealthy by day - this is one big, high-riding van which won't be slipping under anyone's radar. The true offroad van market is dominated by some renowned heavy-hitters. There is no question about the quality of these vans, but they can punch a big hole in your wallet. 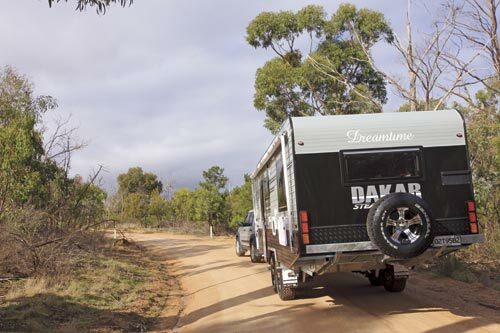 Paul Dean, the director at Bellarine Caravans in Geelong, is taking on the big boys with his new Dakar built by Chief Caravans. 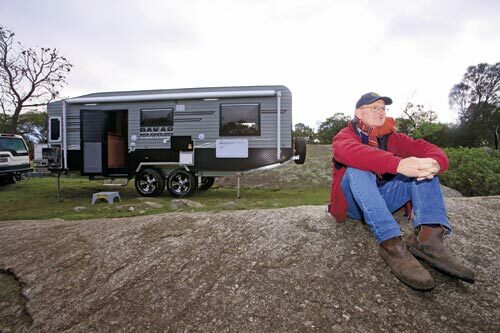 "We've taken on the leaders in the field with a van you can take anywhere," he said. 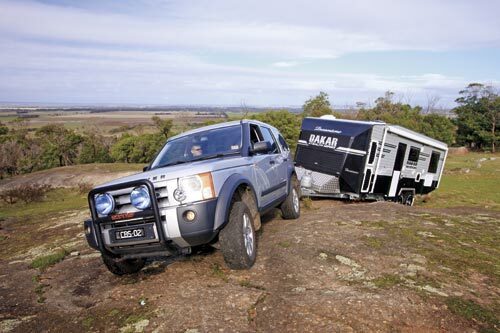 The Dakar's specs and price certainly make it competitive. 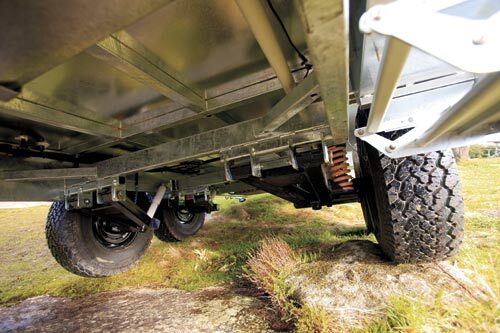 Starting upfront, the Hyland offroad coupling is attached to 6in main rails with 3in raisers, resulting in a travel height of 3.075m (10ft 1in). 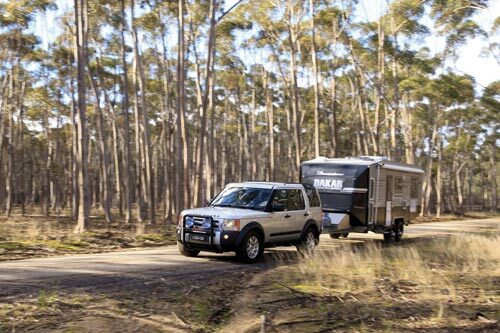 The rig rides on 16in heavy-duty alloy wheels with Cruisemaster coil-spring suspension attached to a hot-dipped galvanised chassis. The cutaway end helps keep the spare tyre and rear of the van clear of any obstacles when heading into steep cuttings or creek beds. 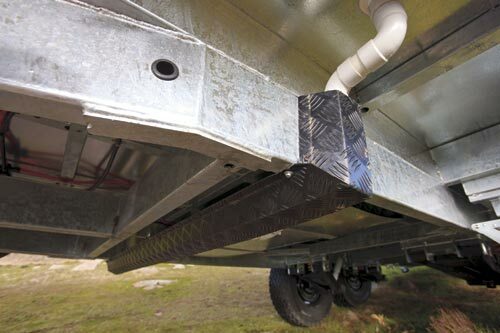 Round-pipe customised side impact bars run down each side of the van (although these are not shown on the review van), and with fully galvanised underfloor protection, the van is set up for some serious bush bashing. Two jerry can holders on the rear bumper (not shown) are also standard. 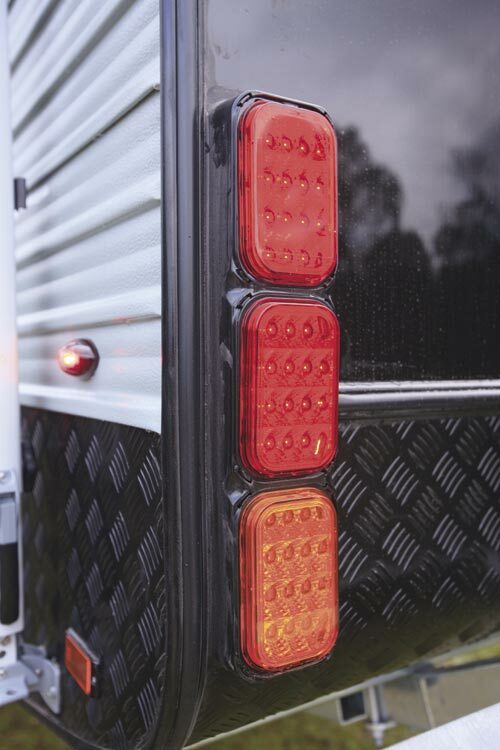 Checkerplate abounds - not only on the front and sides of the van, but in the wheel arches, for the two water tanks and even covering the forward piping and electrical channels. The basic construction is aluminium-clad meranti but extra strength has been provided with 2x1in framing and 280mm stud centres. 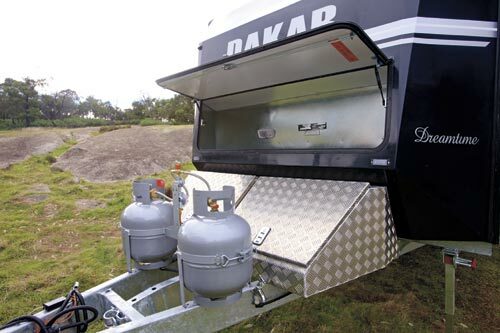 The A-frame has been stretched 30cm, allowing plenty of room for two 9kg gas bottles and two checkerplate lockers which sit in front of the extra large boot. The boot lid is vertical, designed that way to overcome the common problem of water ingress. The stretched A-frame, which is strengthened by an extra 6in centre rail running back to the axles, results in a smaller turning circle and a smoother ride. All of the extra engineering results in a hefty Tare of 2820kg, but this was barely noticeable behind our tow vehicle, a Land Rover Discovery 2.7L turbo-diesel, as we headed off to do some testing on dirt roads and rocky terrain. With the Discovery's airbag suspension, no weight distribution hitches were needed. Outdoor living is made more comfortable under the Dometic 8300 awning with a Swift hooded stainless steel slideout barbecue, an entertainment hatch, 12V outlet, two external speakers, twin LED lights, gas bayonet point and foldout picnic table. Extra power supply is covered with a 120W solar panel on the roof and a generator, which is stored in an offside locker. 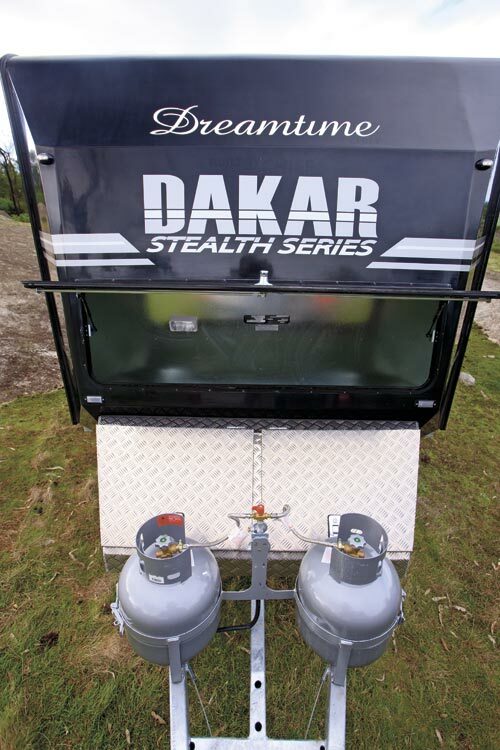 The Dakar might look tough on the outside, but that doesn't mean you will be slumming it inside. The layout, with a rear bedroom, central kitchen and front bathroom configuration, is a change from the norm. Near the footwell on the right hand side as you enter is a cutoff switch that turns off all the lights in the van, very handy for the last person to exit. 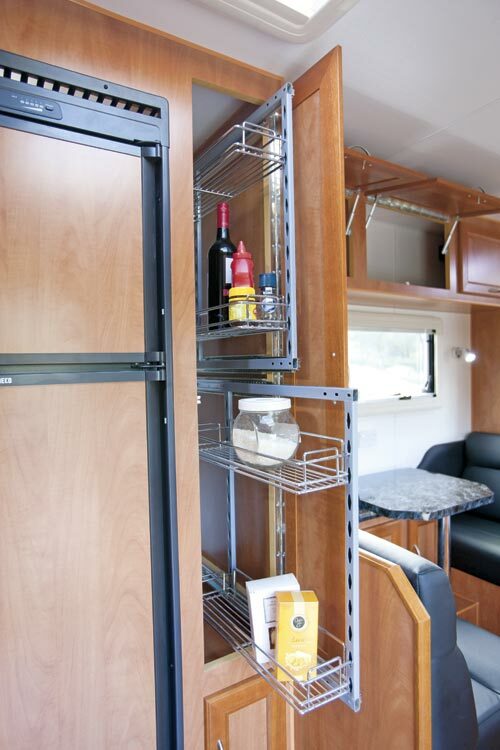 On the left are two cupboards with a shelf (great for placing keys) and a magazine rack above. 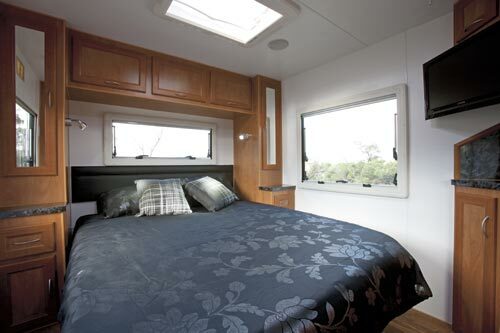 The bedroom is bathed in natural light from three double-glazed Dometic windows and an overhead hatch. The usual side wardrobes, with mirrors, are in place either side, as are the essential reading lamps. Double powerpoints are conveniently placed throughout the van, seven in total, including two on each side of the bed. 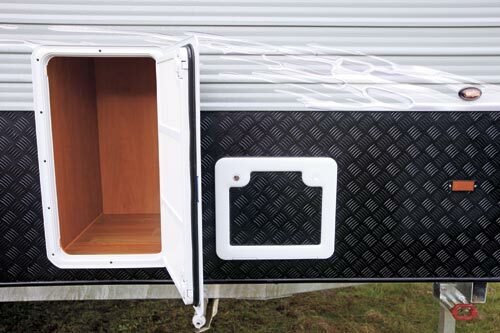 Space under the bed, which measures 1.88x1.52m (6ft 2in x 5ft), is restricted by the chamfered rear of the van. 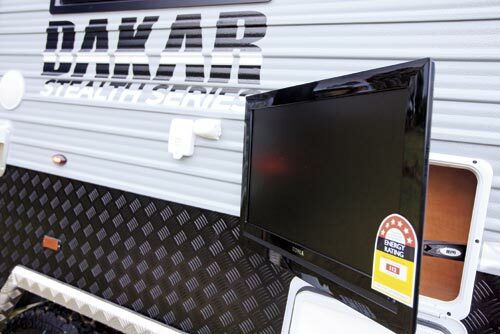 An adjustable TV arm at the offside rear of the bed is in a perfect position for viewing from either the bedroom or the dinette, which is not something that can be said about every van. Isolation switches next to the kitchen adjust the sound between the two outside and four inside speakers and there is also a 12V outlet. The kitchen covers all the bases and gets big ticks for having the LG microwave and 175L two-door Waeco fridge/freezer at perfect heights. Storage is adequate without being copious. Overhead lockers on the offside are wide enough to take a dinner plate but some shelves would make the space more useable. All doors have piano hinges. A good indication of the quality fit and finish is the piping underneath the sink, which is angled to the side instead of going vertically down, leaving a clear space for storage. The same excellent work has been done beneath the bathroom sink. 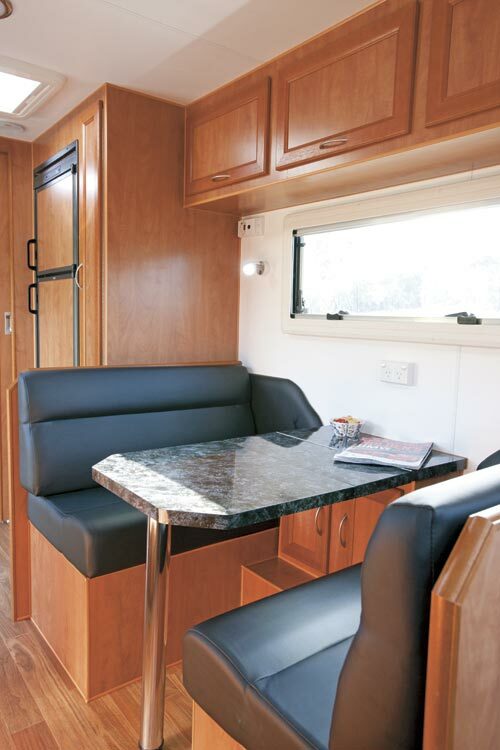 The cafe dinette consists of high-density foam leatherette seats and a tri-fold table. The rear seat houses two gel batteries while access to the front seat storage area would be helped if there was a locker door. Other facilities include a slide-out pantry, water filter, plenty of drawers and a JVC radio with DVD, CD and iPod functions. Benchspace is adequate but becomes limited once the four-burner cooktop lid is raised. 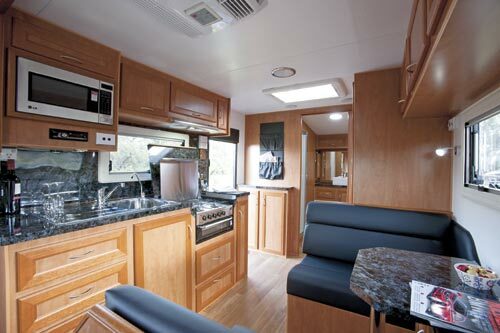 Lighting throughout the van is LED, including three large units that include night-light functions. 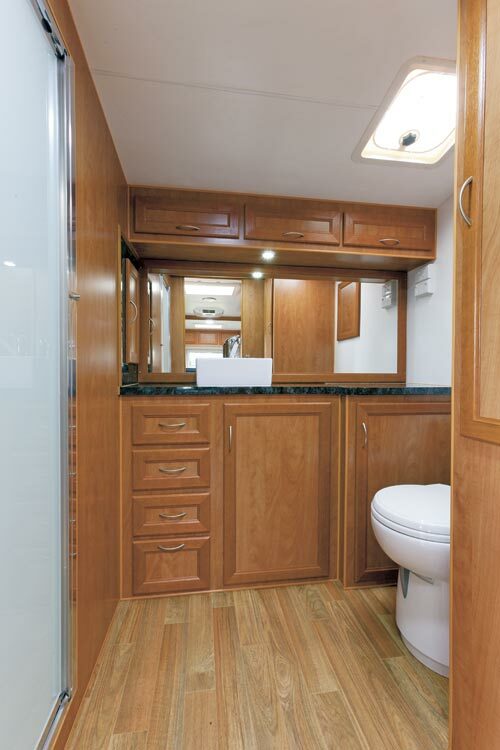 Up front, the only natural light in the bathroom comes via two hatches. The one-piece moulded shower is huge and while the main mirror sits a bit low for tall people, there is a higher mirror above the ceramic bowl toilet. 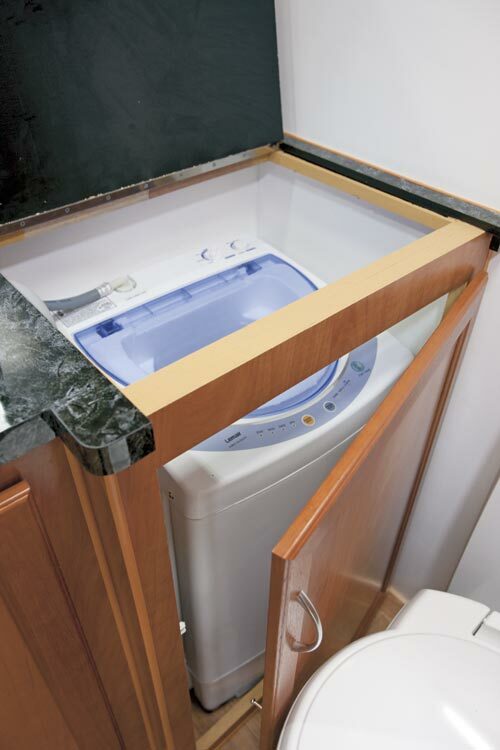 A 2.2kg Lemair washing machine hides beneath a lift-up bench next to the toilet. One way to settle the dust on just how good offroad vans are would be to put them through a series of tests… in the outback. This has been suggested before so maybe it is time to try again. Entry could be open to all, so it would be interesting to see who fronted and what the results were. 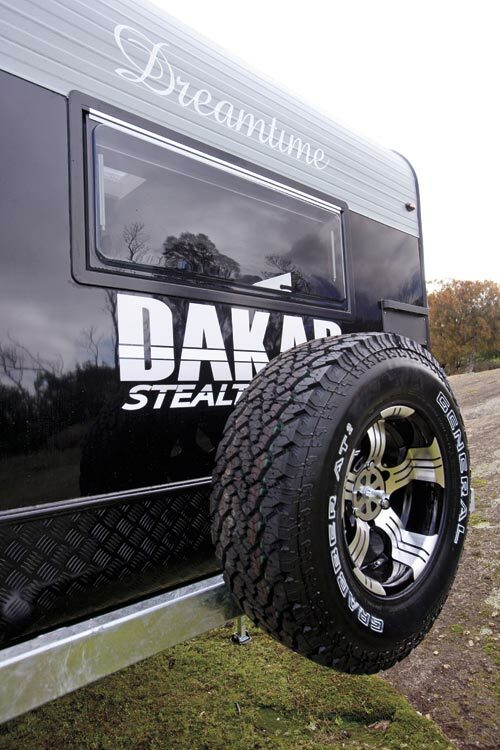 Meanwhile, the Dakar Stealth Series is setting one benchmark that is hard to beat. 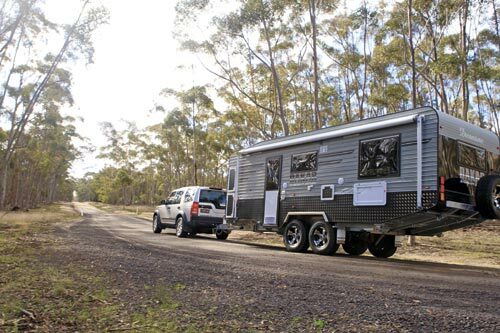 At $75,915, tow-away in Victoria, it has a lot to offer and will be popping up on the radar for a lot of people. Originally published in Caravan World 506, September 2012.